At March’s Network Meeting, Jason Locke (left) and Ben Chobater from the City of Kamloops will be shedding light on the purpose of the Official Community Plan (OCP) — the City’s guiding land use and development document. Locke and Chobater will describe how the OCP relates to food systems and food security in the community, as well as any food security actions as a result. Remember to bring a dish to share for the potluck! The Network Meeting runs from 5:30 – 7:30 PM at the Mt. Paul Community Food Centre (140 Laburnum Street). Join us for our first (of several) joint cooking workshop with Kamloops Immigrant Services! There are still spaces available and the registration has been extended. Contact Elizabeth Brown to sign up: communityconnection@kcris.ca or 778-470-6101. 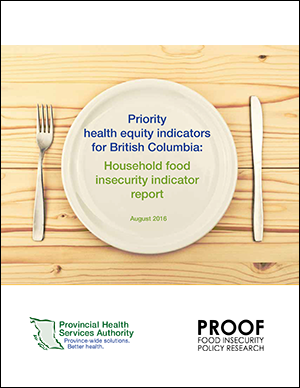 TORONTO, August 31, 2016 — Almost half a million British Columbians experienced some level of household food insecurity in 2011-2012, according to a new report from PROOF, a research group based at the University of Toronto. Drawing on data from Statistic Canada’s Canadian Community Health Survey, the report finds over one in ten B.C. households struggling to put food on the table in 2011-12. Families with children under the age of 18 were at an even greater risk of food insecurity, with one in six B.C. children living in a food insecure household. Click here to read the rest of the story and full report! Victoria residents could soon benefit from the fruits — and vegetables — of their labour. City council is considering letting residents sell backyard fruit and veggies at urban roadside stands to improve local food security. We’re Hiring – Summer Student! The KFPC and the Farmers’ Market are hiring a summer student this year! The job is available to any full time students returning to school in the fall. The 10-week job will be 30 hours/week helping with the Gleaning Abundance Program and the Farmers’ Market. Email Sandra at gleaningabundance@gmail.com by Friday, June 3 with your resume. We look forward to hearing from you! This position encompasses two roles; approximately 20 hours a week assisting the Community Food Action Coordinator on the Gleaning Abundance Program, and 10 hours a week working with the managers of the Kamloops Regional Farmers’ Market. http://kamloopsfoodpolicycouncil.com/wp-content/uploads/2018/04/Gleaning_appreciation-19.jpg 1600 2400 Adrienne de Candole http://kamloopsfoodpolicycouncil.com/wp-content/uploads/2018/04/KFP_logo_print_full_flat-300x180.png Adrienne de Candole2016-05-20 13:43:382018-05-19 02:11:05We're Hiring - Summer Student!